An elegant Bridgehampton home gets thoughtfully tweaked with a fresh makeover to reflect the spirit of its new owners. It all started with a couple of fumbled attempts to refresh her young son Andrew’s bedroom and playroom. After trying out a few different paint colors on the walls that weren’t quite right, Cindy Leibovitch turned to her friend and designer Jessica Shaw, director of interior design at Turett Collaborative in New York City (turettarch.com), to help her get the job done right. 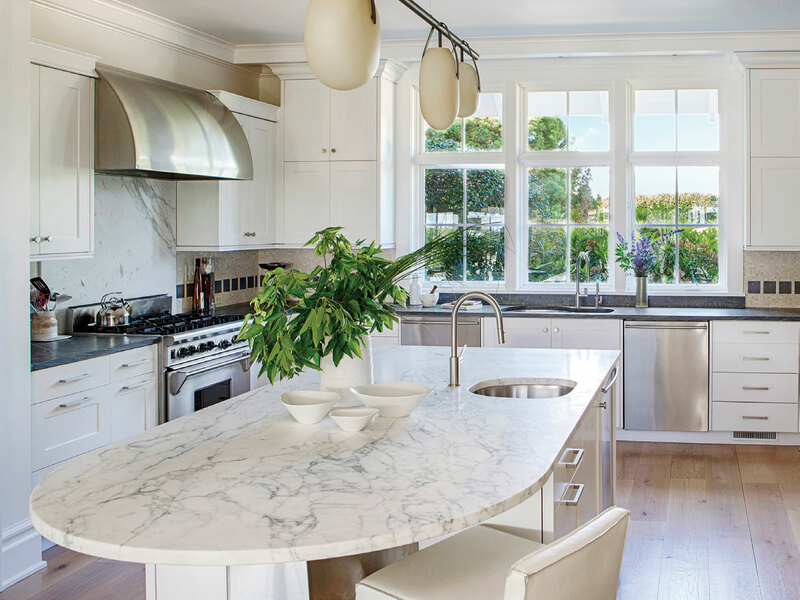 The designer refreshed the kitchen by refinishing and honing the marble island countertop, updating the sinks and faucets and adding a light fixture from Rich Brilliant Willing. “We had worked together on our city home—a complete gut renovation of a townhouse on Charles Street in the West Village,” says Leibovitch. “The home is beautiful and we love every inch of it to this day.” So it was only natural that she would tap Shaw’s talent to update parts of her family’s weekend house in Bridgehampton. Yet to everyone’s surprise, once the bedroom and playroom were done, the project began to snowball until, three years later, they wound up redoing every room in the house. 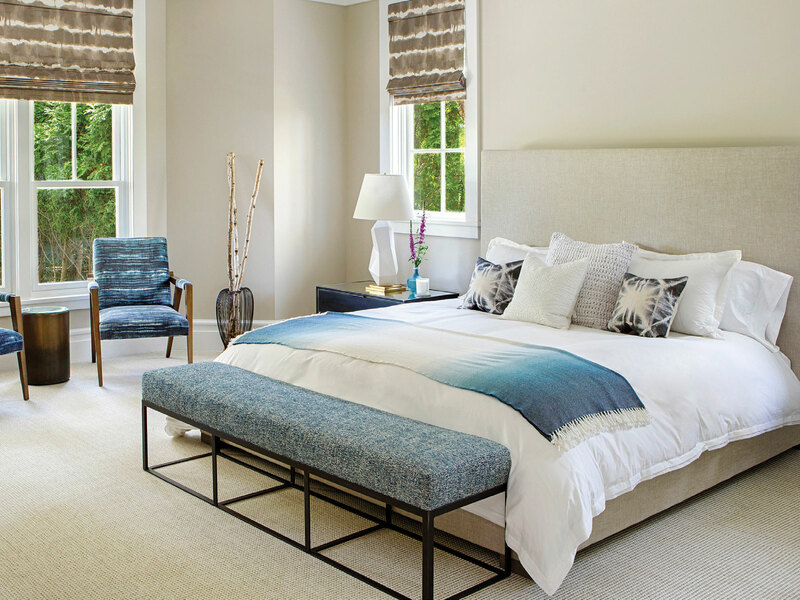 The airy bedroom is outfitted with a bed from Restoration Hardware, Tempest chairs from Kravet and a Cruz bench from Michael Dawkins. “We purchased the house, fully furnished, in 2010 when it was about 15 years old,” says Leibovitch. “It had a warm, traditional feel and we fell in love with it at first sight.” But after a few years, Leibovitch and her family settled into their own rhythm and lifestyle, and their unique needs started to emerge. “The previous owners had an impeccable eye and everything was perfectly positioned down to the books and ceramics,” recalls Shaw. “Yet they were about a generation and a half older than Cindy and her husband, Richard, so after a while they began to feel like they were living in someone else’s house that didn’t really represent them or how they lived,” she explains. The master bath features an oversize window with a view of the grounds. In the sitting room, a pair of vintage Milo Baughman swivel-back barrel chairs set off a custom-scaled curved sofa covered in velvet fabric from Knoll. A branching light fixture by Lindsey Adelman and bespoke coffee and cocktail tables from Michael Dawkins complete the mix. Thus, the second phase of the project involved tying all of the spaces together, starting with the dramatic double-height entrance foyer, which was transformed with a bespoke lighting fixture that fills the massive volume with a multiplicity of dangling lights that “look like starlight,” says Shaw. This lighting element also set the tone for a series of sculptural light fixtures that now enliven all the other rooms. Redefined with contemporary furnishings, sun-washed hues and fresh surfaces, the home now exudes a breezy, beachy elegance. “Everything was tweaked around their particular ergonomics,” says Shaw, noting in particular the sofa in the living room, which was specially scaled to comfortably accommodate Richard’s tall frame. “We furnished the rooms so that the geometry of the spaces cradles you and invites you in,” she says. And now that the previously never-used living room has become Richard’s favorite place in the home and the other neglected spaces serve fresh purposes, all agree their mission has been duly and beautifully accomplished.